Giovanni Ceccarelli was born in Fabriano, Italy and he lives in Paris. He begins studying classical piano at the age of seven, then six years later he discovers jazz. He leads numerous projects, which are dedicated to his own compositions and to original arrangements of music coming from different parts of the world. 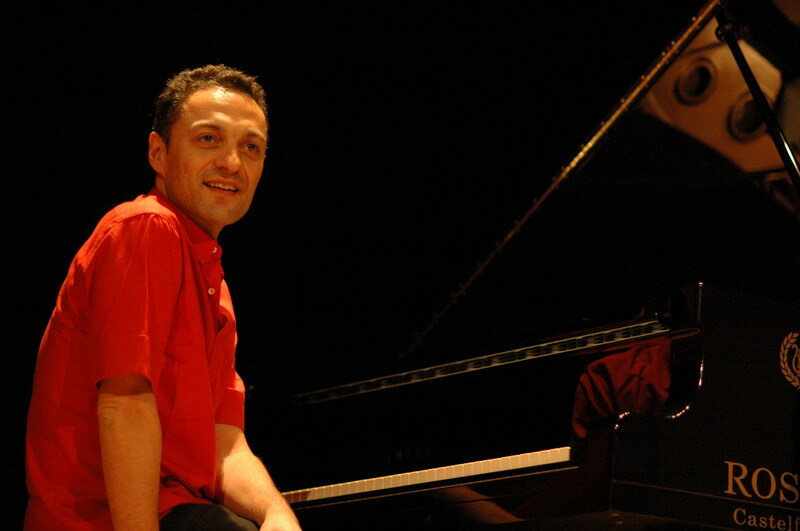 Giovanni Ceccarelli’s first album as a leader is “Daydreamin’” (2010); the CD is recorded in France with Ceccarelli’s own quartet and it is entirely dedicated to original music. “Météores” (2011) is produced by French label Bonsaï Music. Presenting mostly original music, this album is recorded in trio with Ferruccio Spinetti and Francesco Petreni, featuring as guest artists and lyrics composers David Linx and Fausto Mesolella. “Ti Odio”, composed by Ceccarelli and Mesolella and starring the guitarist/vocalist as guest soloist, is released as a video clip, directed by Marthe Le More. The album meets the public’s and critics’ success (“Sélection FIP” by Radio FIP and “Sélection écouters” by radio program “Birdland” – Radio Alpa in France, “Sélection HMCH” by Harmonia Mundi in Switzerland) and it is distributed in Europe and Japan with a special edition. As a co-leader, Ceccarelli releases a piano duet with Eddie Wied, “The Street Dancer” (1998). In 2009 the pianist publishes “Feedin’ Inner Urges”, recorded with vocalist Fabrizia Barresi, and “The Nights of the Beuscher”, a double live album with great saxophonist Massimo Urbani. “Waxin’ in Camerino” (2011) marks a fifteen-year long collaboration with the legendary saxophonist Lee Konitz. Together with bassist Ferruccio Spinetti, Ceccarelli is the founder of group InventaRio, which stars Brazilian songwriter Dadi and Italian drummer and percussionist Francesco Petreni. The album “InventaRio” (2010) is produced by Ceccarelli and Spinetti. It features such great artists as Marisa Monte, Ivan Lins, Petra Magoni, and Pacifico. The record is released in Italy and Japan with a special edition, meeting the success of the public and critics. In 2012 the group publishes “InventaRio incontra Ivan Lins”, a CD entirely recorded with the great Brazilian composer, singer, and pianist. The album is released by famous label Blue Note and it features some outstanding artists, such as Chico Buarque, Samuele Bersani, Vanessa Da Mata, Fabrizio Bosso, Maria Pia De Vito, Vinicius Cántuaria, and Maria Gadú. In 2013 “InventaRio incontra Ivan Lins” is released in Brazil by prestigious label Biscoito Fino; moreover, Maria Gadú includes her recording with InventaRio and Ivan Lins, “Camaleonte (Camaleão)”, in her CD “Nós”. In 2014 the CD is nominated for the “15th Annual Latin Grammy Awards” in the category “Best MPB Album”. Ceccarelli’s latest project is a duo with great Italian bandoneónist Daniele di Bonaventura. In 2015 they release “Mare Calmo”, a CD plus DVD presenting a program of original compositions and arrangements. It is Ceccarelli’s third album to be released in Japan with a special edition by bar buenos aires. The duo’s latest recording to be released in 2018 is a Jobim tribute album, featuring great Brazilian artists Ivan Lins and Jaques Morelenbaum, plus French young jazz star Camille Bertault. Together with saxophonist Marcello Allulli, Giovanni performs a live soundtrack to silent movie “Cenere”, giving concerts in many festivals in Italy, Lebanon, Portugal, and India. Since 2016 Ceccarelli gives Concerts for Syria, which are events for the benefit of association Life4Syria giving humanitarian relief to the civil population inside of Syria. Along his carrier Giovanni Ceccarelli performs and records all over the world, playing with many internationally renowned artists, such as vocalists Amii Stewart, Mark Murphy, Nancy King, Chiara Civello, Ada Montellanico, and Tiziana Ghiglioni, saxophonists Benny Golson, Rosario Giuliani, and Charles Davis, trumpeters Kenny Wheeler, Paolo Fresu, and Enrico Rava, actors Arnoldo Foà and Alessandro Haber, great musicians Tony Scott and Manu Katché, successful duo Musica Nuda. His discography amounts to more than forty records as a leader, co-leader, guest soloist, and sideman. Giovanni Ceccarelli has an intense teaching activity, giving piano, jazz ensemble, and improvisation workshops, clinics, lectures, and courses all over the world. In 1999 Giovanni gives a lecture at prestigious Berklee College of Music in Boston, MA, USA. In 2015 he teaches jazz piano and piano for jazz instrumentalists and vocalists at the National Music Conservatory “A. Vivaldi” in Alessandria, Italy. He has been president of “InJazz” Cultural Association from its foundation in 2000 until 2012, and founding member of “Marchinjazz” Cultural Association.